As a journalist, I have lived and worked overseas and traveled hundreds of thousands of miles. My passport is crammed with dozens of visas from faraway places, with each visa a trigger for memories: some good, some bad, some even horrific. But most of the places I have usually been have not been touristy spots: Iran, Pakistan, and Afghanistan—where they had dozens of vineyards in pre-Soviet occupation times and, so local lore has it, a pretty decent wine was made. So when Rick and Jon announced they were offering a weeklong trip to Tuscany—a place I had never been—I jumped at the chance. 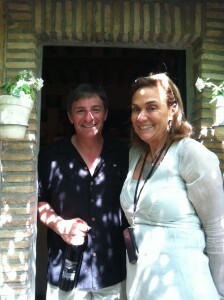 The trip (which I paid for) included airfare, lodging at a lovely restored farmhouse, meals, and, of course, wines. The group was small, around 18 including Rick and Jon. No worries about drinking and driving since we had a bus. And the advantage of going with wine professionals was, of course, contacts. No rushed tasting room visits. We usually never left the lodging before ten in the morning and visited an average of one winery a day during the weeklong trip. We even had our own chef, the talented Daniele Catalani of Washington’s Toscana Café, to cook our dinner while we were hitting the wineries. The only cash needed was for the occasional gelato during an afternoon in Siena and souvenirs. And we were blessed by stunning weather—warm, not hot, during the day, cool at night, and clear skies throughout. Inside the entrance to the castle proper at Castello Vicchiomaggio there is a small reproduction of “La Giaconda”—the Mona Lisa. Asked why it hangs there, proprietor and winemaker John Matta smiles and says, “Look out the door, then look at the background scenery on the painting. They’re the same.” According to local lore, he says, Leonardo da Vinci was a guest at the castle while painting the masterpiece. Well, the scenery does look somewhat the same, although it has undoubtedly changed in the 500 or so years since Leonardo painted his most famous work. But the story, appealing even if apocryphal, underscores how tradition hangs like the grapes on the vines themselves at this historic property. The property on top of the breathtakingly scenic vine-covered hill (and there are lots of them in Tuscany) in Greve in Chianti dates back to at least the 5th century. Matta jokes that none of the workers have started arriving in Mercedes or BMWs, so he is pretty sure no one is stealing Etruscan artifacts uncovered whole planting and selling them off to collectors. The estate was a storied fortress during the myriad feuds of the Renaissance. Today there is still the elegant house (which takes in paying guests) with its own church (available for weddings) and, of course, the vineyards and winery on the 150-hectare estate. 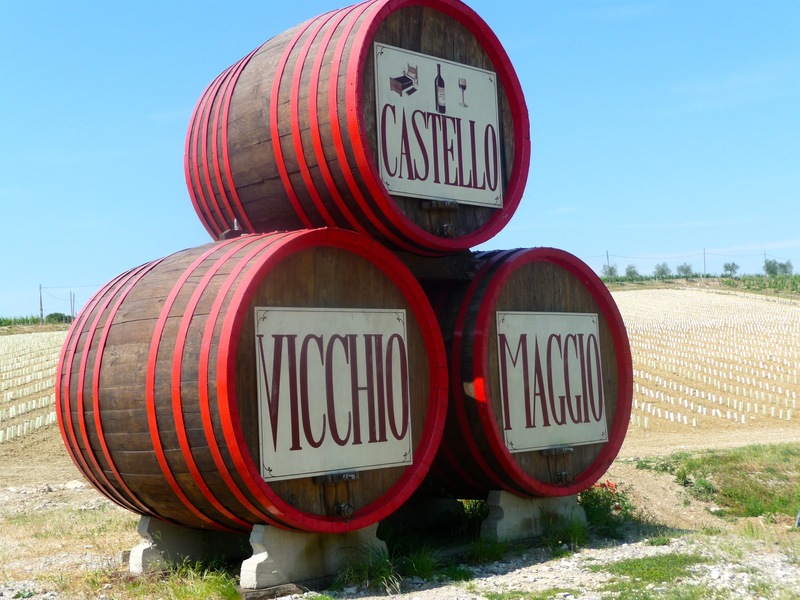 Wine has been produced at Castello Vicchiomaggio as long as can be documented, and John and Paola Matta, who acquired the estate in 1964, hew to the ancient traditions of the place. In adherence to the strict production code of Chianti Classico, only emergency irrigation is permitted. Sangiovese is the primary grape, of course, but merlot and cabernet sauvignon, as well as small batches of other varieties, are also grown. Replanting takes place on a regular basis. Cultivation is meticulous, Matta says, which makes for lesser yields but more concentrated flavors. Picking on the 32 hectares devoted to grapes (the rest is used for olives) is done by hand. Such detail pays off. 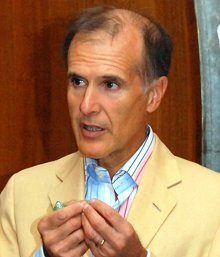 The wines have won numerous awards in Italy and abroad, and so has John Matta himself. Four times Matta, who is British-born of an Italian family, has been named Italian Winemaker of the Year at the International Wine and Spirit competition. A sumptuous lunch was the palette for our palates, as we tasted several of Matta’s best wines and enjoyed Tuscan hospitality. (I can never get enough of pasta alla cinghiale, the region’s ubiquitous wild boar ragù sauce.) As a general observation, the wines have a depth of elegance and grace lacking in many of the Tuscan wines that make it to our shores. But even after we left Castello Vicchiomaggio and our palates waded through a thicket of Chiantis and Brunellos and super Tuscans throughout our brief trip, it was one of Matta’s wines that everyone in our group seemed to favor and return to again and again while relaxing in the evening. His 2008 Castello Vicchiomaggio “La Prima” Chianti Classico Riserva is quintessentially, traditionally Tuscan. I think Leonardo would be proud. Olivier Paul-Moradini—just call him Olivier, it is easier—is easy to hate: he has rock star-looks and an impossibly beautiful hillside property in Tuscany’s maritime Maremme region that turns out wines of great depth and charm. Olivier also possesses great charm, so, no one can really hate him. And we were privileged to be the first group to visit Volpaiole. Olivier is not of a winemaking family. He is a Belgian whose job was, of all things, as a European Union bureaucrat. He worked to improve a European-wide emergency call system, establishing 112 as Europe’s emergency phone number, just like 911 in the United States. 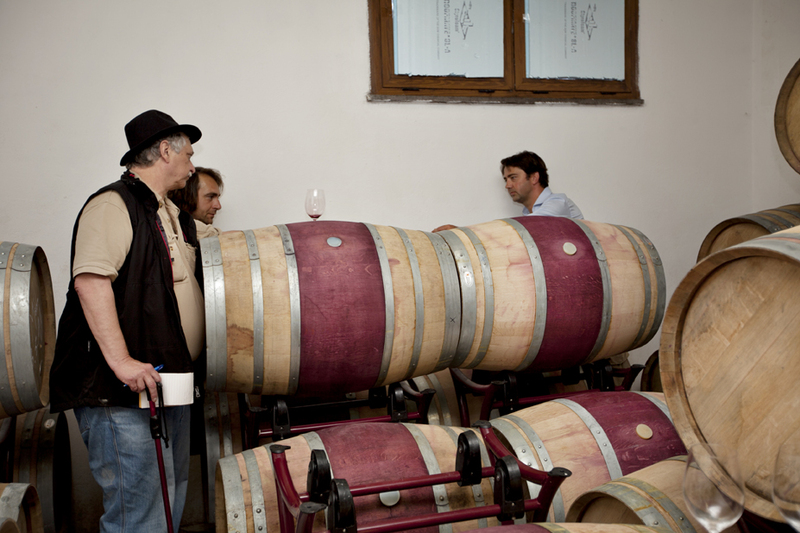 But on visits to Tuscany, Olivier fell in love with the wines of a tiny mom-and-pop winery, Volpaiole. Located on the coast of Tyrrhenian Sea, the island of Napolean’s exile, Elba, is visible from the hilltop winery. Olivier returned time and again, befriending the owners Armin and Liliana. In 2007, the couple said they wanted to retire and offered Olivier the opportunity to buy Volpaiole, which means “Fox’s Corner.” He jumped at the chance. When I say “tiny” I am not kidding. The vineyards are a shade over one hectare, although some new plantings were planned to perhaps double that. Sangiovese, cabernet sauvignon, and merlot are cultivated, along with some cabernet franc. Olivier and his winemaker Luca D’Atomma like to keep things green. Grapes are handpicked, and the skins and stalks are recycled back into the soil. Barrel tastings are fun. It is like going to a movie before it is released or getting an advance review copy of a book. The 2010 Cabernet Franc in barrel is botanical, with herbal notes of nuts and basil. The 2010 Cabernet Sauvignon, also in barrel, was raw but showing great promise with lovely cassis flavors. 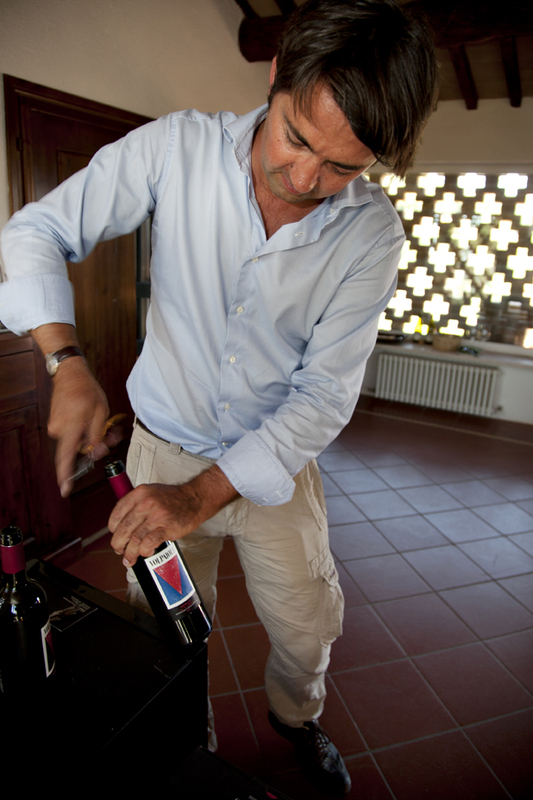 And the 2010 Sangiovese, which will be the spine of Olivier’s Volpaiole Classico, was an earthy, meaty cornucopia of flavors, dominated by dark black cherries and oak. After barrel tasting came a stunning lunch cooked by a local chef from Le Nuvole RistoBistro in nearby Suvereto. Aperitifs were served on the terrace with (yes, another) view to die for. A parade of Volpaiole wines, including several from the winery cellar from a time before Olivier took over, were trotted out. Even a 2001 Classico from magnum seemed still quite young and tannic, almost Bordeaux-like. The 2007 Merlot had some of that barnyard quality that some people look for in organic wines. Most certainly NOT your father’s Merlot, and needs food. The Classico from the same year was lean and peppery. Applause for our chef, who turns out to be American. Timonthy Magee is from Nevada, but locals do not hold that against him. Nope, I cannot hate Olivier. But I sure can be jealous. The lovely thing about Tuscany is the towns. Treasures abound in towns big and small—a tiny church redolent with the smells of incense and ancient candle wax with an obscure Renaissance fresco; a small shop with a wizened old lady hand making linens; a storefront selling the creamiest, richest gelato that has ever crossed your jaded palate. 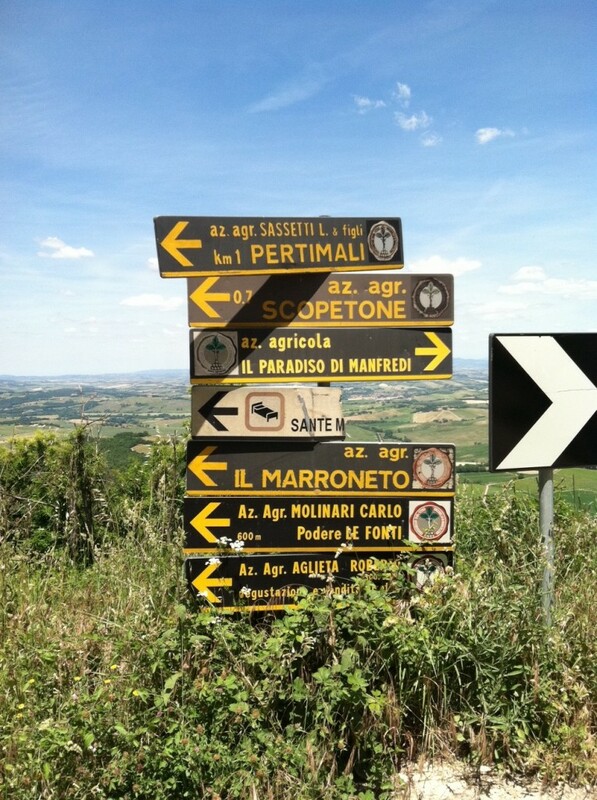 When it comes to Montalcino, the town has all that AND the wines, too. A steep cobblestone street down the middle of the medieval town is a thoroughfare of temptation. Small enoteca, or wine shops, beckon with free samples of the most well known product, Brunello di Montalcino. Stick your head in any of these shops and you can taste a host of one of Italy’s most fabled and expensive wines. But the problem is that the really good stuff is not put out to sample. A lot of what is offered is second tier, young wine. As any lover of Brunello will tell you, the wines have to be at least ten years old before they really strut their stuff. So we are off to visit Aglieta, a beautiful winery run by a beautiful woman. But there is no way to get to her house, perched on the hillside vineyard, except by four-wheel drive vehicle—or walk. Some of group walk; I opt to ride. I have bad knees! First come, first served. Patrizia Aglieta is as elegant and beautiful a lady as I have ever met. We all sit on her stone-paved terrace overlooking the vineyard, with a vines winding through a wood-latticed roof offering shade. 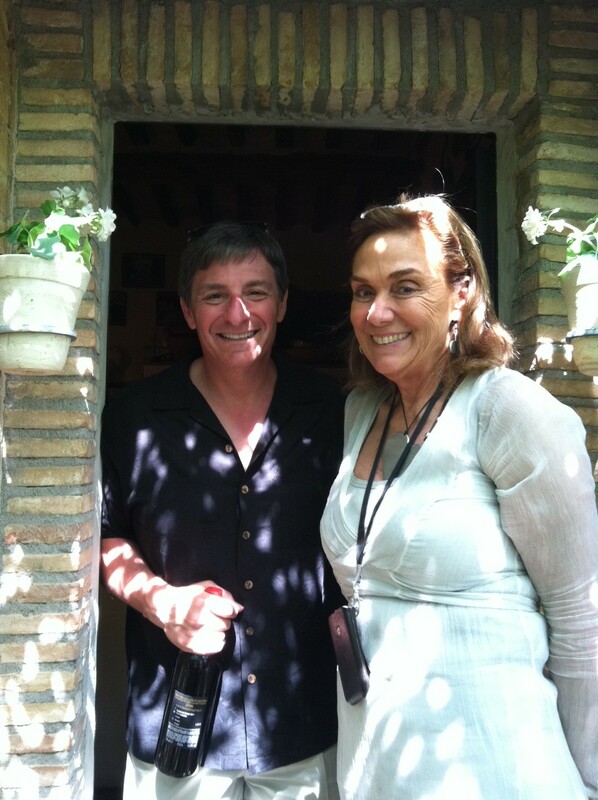 Patrazia explains how she and her Harvard Law School-educated husband Roberto discovered Montalcino and bought the farm in 1989. At her urging, he planted a small vineyard, the first of several, and embarked on winemaking. 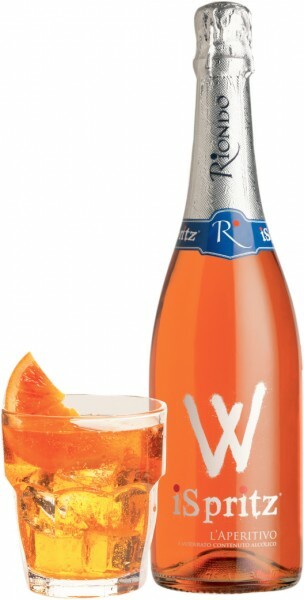 Tragically, Roberto died after the 2008 harvest, leaving Patrizia to carry on. And she does, admirably. The garage serves as the winery producing small batches of her Brunello and a Super Tuscan. Brunellos are made from a feisty sangiovese clone that gives the wines their unique character. 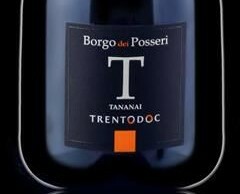 But winemakers in Montalcino are also making the so-called “Super Tuscans,” wines that do not fall under the legal DOC or DOCG designations because of the use of other grapes. A bottle of the 2006 Brunello di Montalicino is a lovely beauty, redolent of earth, licorice, and truffles, but still too young to be fully showing its charms. As a dessert surprise (as if we needed it) Patrizia orders up a bottle from the cellar, inherited from a previous owner. What is it? She does not know. It is an unlabeled bottle estimated to be 30-40 years old. “Well, let’s taste it,” she says. But whatever it was, it is a whisper of its former self, with a nose like aged sherry and a taste of figs. But it is a fitting coda to the trip. As a journalist, I remember the maxim: when traveling into the unknown, expect the unexpected. I guess your palate knows that, too. Very nice post Gary, thank you. This Tuscany is really a taste of Italy – one of its best part!